Making one of these books is not a trivial process; there are many steps involved. 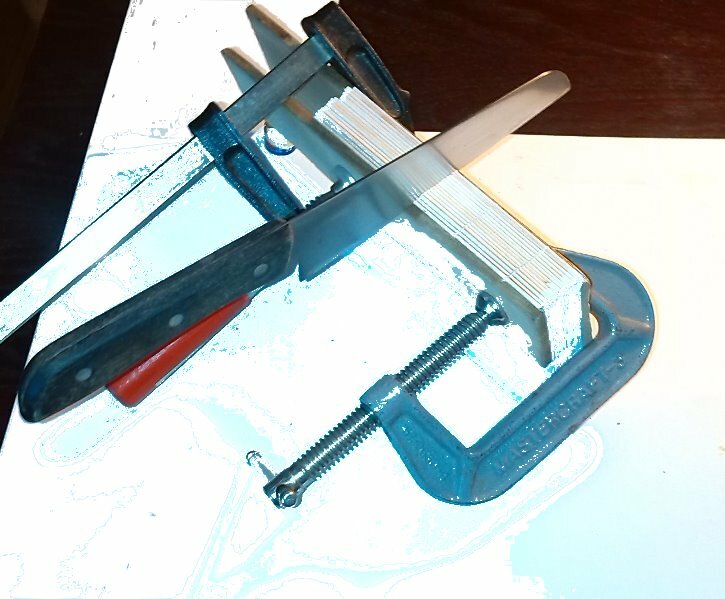 Before I can begin to print I must create the master file, which in itself has several steps and is by far the longest part of the process. Fortunately, it only needs to be done once, and then I can start printing. So -- I print the pages, fold them into their signatures (quires), and stitch them together. 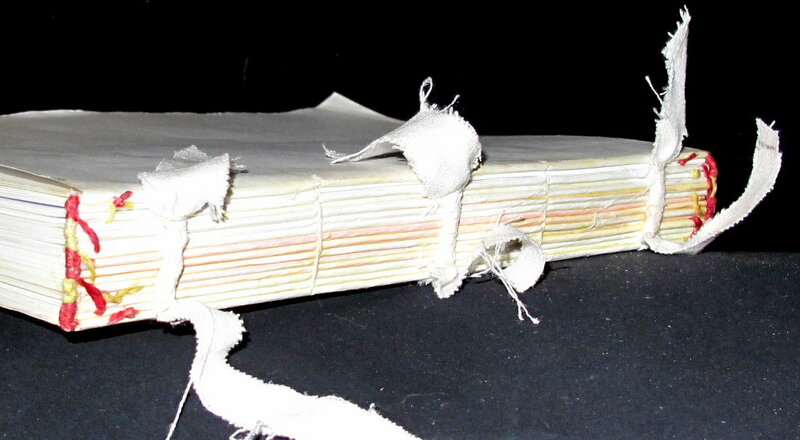 Next comes my least favourite part -- ploughing the edges of the sewn book to make them even. Then I sew the enddbands and attach the cover boards. Next the cover material is glued on, and finally, the decorations. Then I have a nice stiff drink . The first step in creating a new manuscript is to download the page images. This is pretty straightforward, but very tedious. Click on next page, wait for it to load. Right click, Save As, save. Do it again. And again. For all 215 pages <yawn>. The pages tend to have unmanageable names such as "ms0128-lat_hi-res_p012.jpg", so I get to write a little script to give them shorter ones ("012.jpg"). Just as well I used to be a programmer! Once all the pages are saved, they need to be edited. So--into PhotoImpact (the poor man's Photoshop, and much easier to use), 20 pages at a time. At this point I make sure the page image is a proper rectangle, using distortion or perspective tools; since the original manuscripts are books, the page images can be slightly skewed if the book could not be opened perfectly flat without damaging it. I then trim away any background from the image, and perhaps bits of edge damage or darkening. Finally, I usually enhance the image in some way, typically brightening and increasing the contrast a bit so that it will look good when printed. So I now have all the images, cleaned up and sensibly named, ready to be made into a book. For this I use Word 2017 (having muttered and cursed at my old version of Word and finally bought a newer one). I then proceed to make a series of files named "sig01" through to "sig18" or so, depending on how big the book is, each containing 24 pages. This gives me six-sheet signatures. Eight-sheet signatures were a bit more usual for real medieval books, but I have found six easier to manage for sewing and putting the books together, particularly for rounding the spines evenly. Also, it's less paper and ink wasted if the printer stuffs up totally. As I create the Word files I pick a nice blank page from the images as a background for the other pages and to provide front and back flyleaves if the book itself does not have sufficient. I need at least one blank page front and back to glue to the cover boards, and I also like to have a blank page before the text starts. 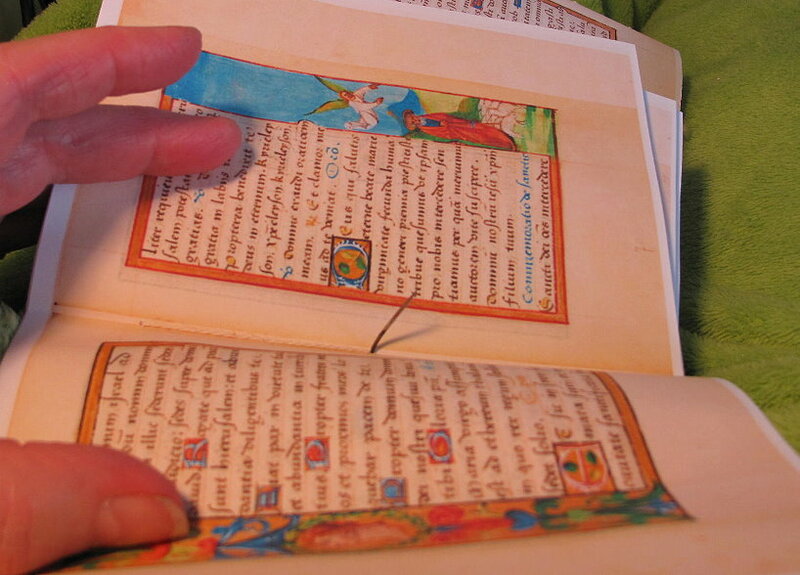 Few manuscripts are exactly A5 or A6 and some have been badly cropped over time, and I like to have the parchment image extend as far as possible towards the edges so I don't remove any of the real image when I'm ploughing the page edges, hence the background image. The master copy is ready. I can print! If it's a laser print, this is not a major production unless toner runs out. However, the inkjet is a different story. The first step is to fill all the ink tanks and print a check pattern to see that everything is working properly. This in itself can be quite a production as anyone who's worked with an inkjet printer well knows. Mine is a Canon. It's a nice printer, but it has its moments. After cleaning the print heads, re-cleaning the print heads, cursing the print heads, taking the print heads out and washing them and doing it all again, printing can commence. All works well for three pages, then the yellow stops. Or the blue, or--but you get the idea. Back to previous paragraph. And when by some miracle everything is working perfectly, on the first page of printing the second sides, the printer grabs two pieces of paper at once and you have to reprint the whole damn signature. But after an entire afternoon of poking, prodding, and cursing, I actually have an entire manuscript printed, the signatures folded and in their correct order. After initial nightmares of trying to keep things in order, I have now learned to fold the signatures as they finish printing, stack them up in order, and weight them with something so they cannot get pushed into disarray. Before I start sewing I ususally leave the book being pressed for a few days to get it all as nice and flat as possible. I use a little old anvil for a weight, as it's both heavy and compact. Now that I have the signatures flattened, I can make the holes for sewing. I began doing this using an awl, but it wasn't very easy to get the signatures aligned nicely, so I shifted to the other period method of making cuts in the back of the signatures. 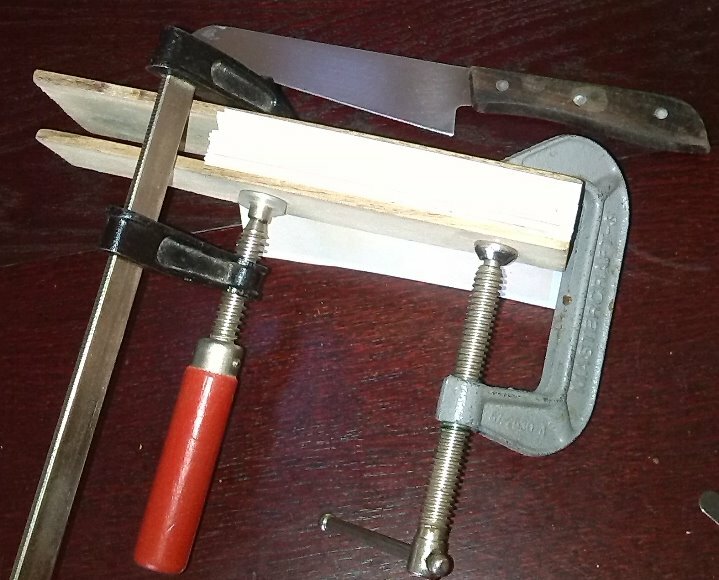 For this, I clamp them between two pieces of wood leaving about 4mm of the spine edge exposed, then cut across with a nice sharp kitchen knife. I usually make five cuts for an A5 book, and three or four for an A6; both were common in period. Now it's time to thread up the bent needle and begin to sew. It's difficult to sew the signatures together with a straight needle, and fortunately it's quite easy to bend a sewing needle over a candle flame using two pairs of pliers. I recommend bending it to a full right angle as you're less likely to stab yourself with it (the point isn't where you'd normally expect it to be when sewing). 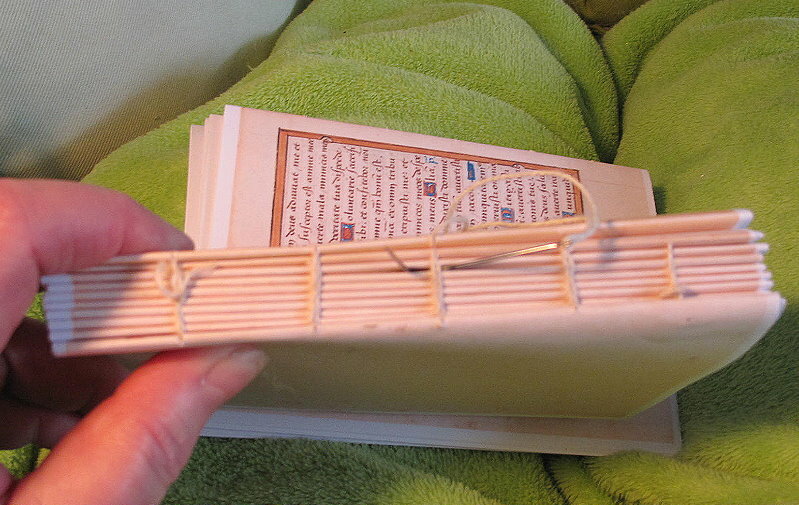 Although it would be more authentic to sew the book on a sewing frame, I haven't yet made one. This is mostly because I don't sew the signatures onto a pair of cords in the typical period manner, but simply sew them together using link stitches. I then sew tape across the spine in several places, pulling the middle of the tape into a cylinder to simulate the effect of cords and produce the proper ridges on the spine. Why not cords? Cords don't lie flat the way tape does, and thus will not work properly with the way I make the cover boards. My improvised ploughing press, while far, far cheaper than a commercial one, has its problems. 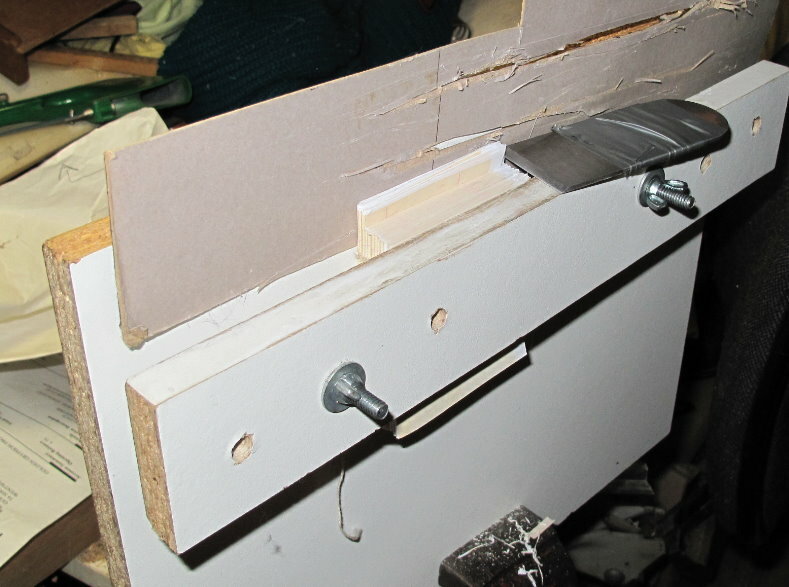 Even with the press lying flat on a bench, it is difficult to get the bottom edge of the book block completely flat, and to keep everything in place while the wing nuts are tightened. I keep forgetting to place a piece of cardboard behind the book so the last few pages don't try to dig into the groove worn in the back board. It is also hard to keep the knife edge perfectly flat. My first try at a cutting implement was a circular blade with a wooden doorknob glued to its top surface. It cut beautifully, but the cut edge slowly crept upwards as the ploughing progressed, no matter what I did. I now know this is a result of the shape of the cutting edge, which is a chevron in cross-section. Any blade which is not flat on its lower edge will make the cut creep up. My next try was a much thinner utility knife blade, the sort where you snap off segments as it dulls, but of course it had the same problem. 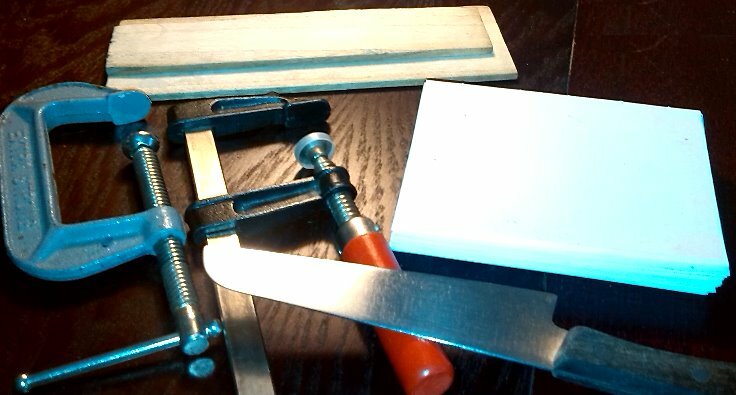 Thanks to a suggestion by Helen Schultz, a most splendid book binder, I now use the blade from a dinky little old wood plane, which was no use at all for its intended purpose, but works perfectly as a book plough. Once the pages are trimmed, I sew the endbands. There are several good tutorials on YouTube of how to do this, but I must confess I'm still not very good at it. I began by using a thin strip of cardboard as the endband support, but now use a short length of waxed light cord as I find I can control it better. The thread for the bands is my own hand-spun silk, dyed with natural period dyes. I usually do two-colour bands, though I sometimes use single-colour raw tussah silk (beige). The protruding ends of the cord are cut close and a dab of glue applied to the very end so the thread doesn't work loose. What glue do I use? 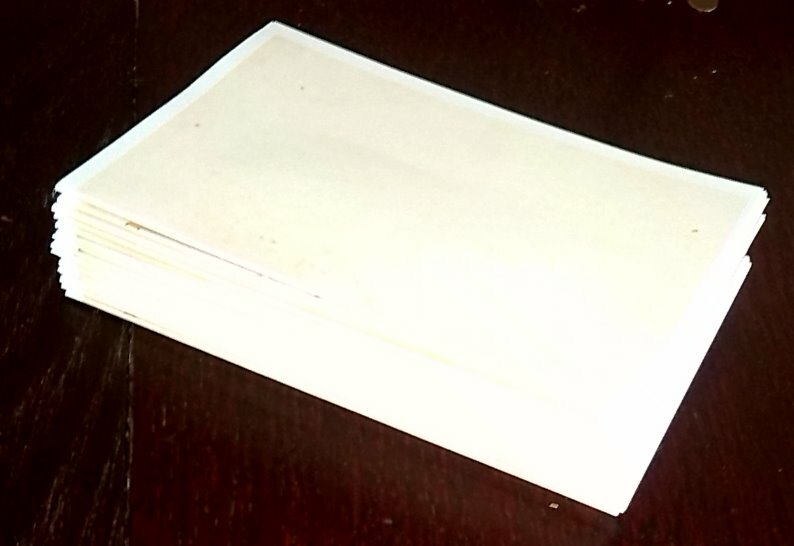 It has varied--I have made my own bookbinders' flour-and-water paste, which works nicely for pasting the cover boards, cover, and flyleaves, but I mostly use ordinary white PVA glue as it's cheap and convenient. So if you are ordering a book and want it done with the more authentic paste, just let me know and I'll cook up a batch. Before the cover boards can be put on, the spine needs to be glued and rounded. First, linen tapes must be sewn across the spine to attach the boards to. The proper period method would be to sew the signatures to tapes or cords as they are sewn together, as mentioned above, but I don't want the tapes to lie flat across the spine and cannot easily attach cord to my covers. This is because my covers are not actually wooden boards, but two pieces of heavy cardboard. I can assure you the card is much easier to use than wood! I use two to five tapes, depending on the size of the book and the effect I wish to create. The tapes are sewn across the spine and the sewing thread is pulled up hard so the tape forms a solid cylinder, simulating the effect of cord on the spine. The tape ends are then glued flat between the two card pieces and weighted while the glue dries. The end result of all this once the cover is on is a reasonable approximation to a period binding without too much labour, allowing me to keep my prices down. An added benefit of the cardboard is that it allows me to impress lines into the leather cover quite easily without having to use hot tooling. I actually use a small brass letter-opener from my old family home, which works very nicely. Back to gluing and rounding the spine, which happens after the tapes are sewn on (or it's well-nigh impossible to get a needle under the link stitches--this is experience speaking). 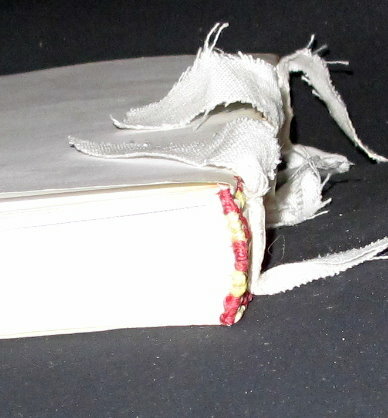 Glue is applied to the spine and rubbed in well so the backs of the signatures are held together and there are no gaps exposing the link stitches and tapes when the book is opened. I normally use PVA glue for this, as it is stronger and more flexible than traditional book paste. After the glue is on I wait till it is almost dry (no longer sticky but still cold), then flex the pages and hit the spine with a hammer in the manner illustrated by YouTube gurus. 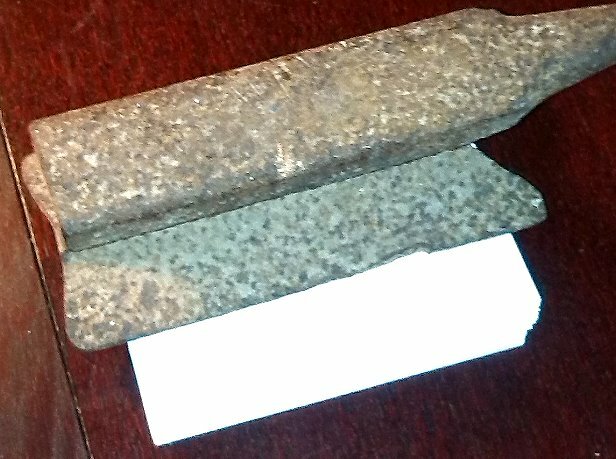 Then having failed yet again to make that work as desired, I squish each side of the spine hard against the benchtop, poke and prod it, wield the hammer in interesting ways, and weight it to dry. At this point I should glue mull (stiffened muslin) over the spine to also be attached to the boards, but I don't. So There. For the books' outer covers, I cut a rectangle of fabric or leather the size of the cover, plus the width of the spine, with a suitable overlap, generally 2-3 cm (about an inch). The closed book is placed carefully on the underside of the cover, I glue the top board, and firmly pull the cover material up around the spine and over the board, making sure there are no wrinkles. Possible wrinkles are why I pull the cover up and over rather than just placing the glued board down on the cover material. Once the top cover is dry, the book is turned over and the other board and spine glued. It's important to only glue the spine in the middle up to the tapes at each end, otherwise the cover cannot be turned under across it. I then pull the rest of the cover up and over the the spine and board, pressing firmly on the spine and again making sure there are no wrinkles. Once the cover is all dry, I open the book up and trim the cover material at the corners so it will fold neatly. Then I glue along the lower edge of the cover and fold it over, tucking it under the spine and pressing down firmly. When the glue is dry, the same thing is done for the upper edge, and then the two side edges. This is not as easy as it sounds, especially if the cover is leather. Things have to be pulled, pushed, and coerced into sitting properly, and I have to try to keep any glue from getting on the cover, especially if it's fabric--it's very hard to get glue out of velveteen. I will often just do the edges of half the cover at a time and then glue that flyleaf down and wait for it to dry before doing the other half. When all three edges of the cover material are folded over and the corners coaxed into the best alignment that can be managed, I glue the flyleaves down. It's important to work quickly and not get the paper too wet, as otherwise it may tear. 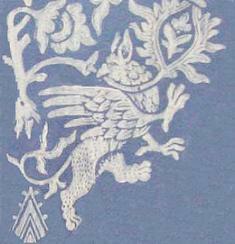 This is an advantage proper period vellum has over paper; vellum is tough and hard to tear. Period paper was likewise tougher than moden paper, as it had a high linen rag content. 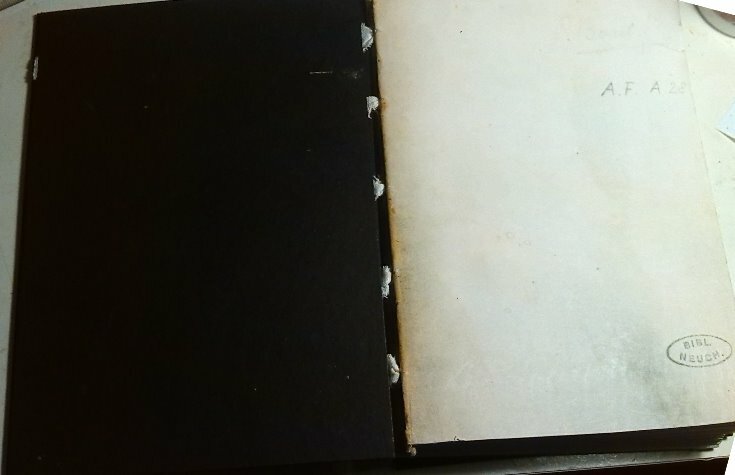 The flyleaf must be lowered carefully and quickly smoothed to avoid wrinkles. Sometimes all my efforts fail, the flyleaf tears, and I need to glue in a separate leaf to fix this. Thus if your flyleaves look a bit thicker than one sheet, don't try prising the extra sheet up; I guarantee you'll be sorry . When everything is dry, I can do any cover decoration.